Dual etalons with pressure tuning allows for <0.5 Angstrom bandpass, providing 3D-like enhanced surface detail. Externally mounted 50mm Ha filter. B600 – For visual use. 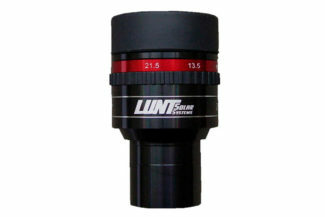 The addition of a secondary front-mounted interference filter and the upgrade of the rear trimming filter transforms the Lunt LS60THa into a superb visually-enhanced instrument with the ability to also image the Sun utilizing basic camera equipment. Adding the front filter provides a view of the Sun in virtual 3D. An active ball of churning boiling gasses that spew from the surface in what can be violent eruptions. Cause and effect can be viewed and imaged in real time. An upgrade to the visual system, which comes standard with the pressure tuning system, puts a research grade instrument into the hands of the observer and the imager. True Doppler Tuning (Pressure Tuning) allows for a shift into and away from the user, adding a 3D like component to the viewing experience. While it has minimal effect on proms due to their being at the edge of the disk, it does have an effect on filaments and active regions on the surface. While looking at a filament at the center of the Sun the user has the ability to Doppler shift from the base of the filament to the tip, following the filament thru it’s structure toward you and away from you, allowing for enhanced visual and imaging capability for the observer as well as a research tool for the avid hobbyist. The pressure tuning system provides an order of magnitude more precision to the tuning of the desired features. Probably the only Solar Telescope you will ever need. Ultra-Narrow Band Hydrogen-alpha (656.28 nm) Dedicated System. A 60 mm refractor based system with additional 50 mm aperture secondary removable filter. Dual etalons with Pressure Tuner allows for <0.5 Angstrom bandpass, providing 3D like enhanced surface detail. The larger rear trimming filter allows for imaging with most basic camera equipment. The system includes the clamshell with threaded holes for mounting, dust caps, and is delivered in 2 Aluminum re-enforced cases. Internal etalon allows a <0.75 Angstrom bandpass. The LS100THa includes a 2″ Starlight Instruments Feather Touch Focuser, aluminum case, a sun- finder, 12″ dovetail and your choice of blocking filter.